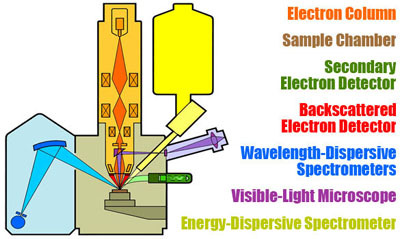 What is Electron probe micro-analyzer (EPMA) ? analyzing crystal-lattice preferred orientations (EBSD). An electron microprobe operates under the principle that if a solid material is bombarded by an accelerated and focused electron beam, the incident electron beam has sufficient energy to liberate both matter and energy from the sample. These electron-sample interactions mainly liberate heat, but they also yield both derivative electrons and x-rays. Of most common interest in the analysis of geological materials are secondary and back-scattered electrons, which are useful for imaging a surface or obtaining an average composition of the material. X-ray generation is produced by inelastic collisions of the incident electrons with electrons in the inner shells of atoms in the sample; when an inner-shell electron is ejected from its orbit, leaving a vacancy, a higher-shell electron falls into this vacancy and must shed some energy (as an X-ray) to do so. These quantized x-rays are characteristic of the element. EPMA analysis is considered to be “non-destructive”; that is, x-rays generated by electron interactions do not lead to volume loss of the sample, so it is possible to re-analyze the same materials more than one time. Electron probe micro-analyzer (EPMA) Instrumentation — How Does It Work? A series of electromagnetic lenses located in the column of the instrument, used to condense and focus the electron beam emanating from the source; this comprises the electron optics and operates in an analogous way to light optics. A sample chamber, with movable sample stage (X-Y-Z), that is under a vacuum to prevent gas and vapor molecules from interfering with the electron beam on its way to the sample; a light microscope allows for direct optical observation of the sample. A variety of detectors arranged around the sample chamber that are used to collect x-rays and electrons emitted from the sample. A typical arrangement in a probe lab is a vertical electron-beam column, an array of detectors placed around the sample chamber block, a sample entry vacuum lock, a console to control operating conditions, screens to view control interfaces and sample output, and a computer for control of data acquisition. Quantitative EPMA analysis is the most commonly used method for chemical analysis of geological materials at small scales. In most cases, EPMA is chosen in cases where individual phases need to be analyzed (e.g., igneous and metamorphic minerals), or where the material is of small size or valuable for other reasons (e.g., experimental run product, sedimentary cement, volcanic glass, matrix of a meteorite, archeological artifacts such as ceramic glazes and tools). In some cases, it is possible to determine a U-Th age of a mineral such as monazite without measuring isotopic ratios. EPMA is also widely used for analysis of synthetic materials such as optical wafers, thin films, microcircuits, semi-conductors, and superconducting ceramics. For more information about Electron probe micro-analyzer (EPMA) follow the links below. Compilation of Microprobe Labs in the US and Canada by Stephen Kuehn, Concord University, W VA. Teaching activities, labs, and resources pertaining to Electron probe micro-analyzer (EPMA). Extending Mineralogy by Electron Microprobe Analysis (Goodge, 2003) is a lab module that shows how microprobe analysis can be integrated in the learning environment. It uses EDS, BSE and WDS techniques to help make connections between mineralogy and petrology. It can be done with an in-house SEM or EPMA, via remote teleconnection to another lab, or even entirely on paper. Working with Electron Microprobe Data from a High Pressure Experiment (Schwab, 2004) is a problem set in which students use electron microprobe analyses of a peridotite partial melting experiment to determine mineral formulas, calculate unit cell content, plot results on a classification diagram, and use a geothermometer. Zoned Plagioclase Exercise (Smith, 2003) allows students to become familiar with the various types of zoning found to occur in plagioclase feldspars, recognize and identify the various zoning types, and interpret the petrogenesis of the various zoning types from optical and microprobe data.